Sue from No Problem got in touch yesterday to explain their no-show on Thursday afternoon. Then we caught up on a walk over to Fleckney. They’ve chosen to go hi-tech, with AGM batteries (Absorbed Glass Mat) instead of the more conventional lead/acid. These, although dearer, are reckoned to be more rugged and durable. We’d noticed, over the last few days, a marked drop-off in performance from our batteries. I check the electrolyte levels every couple of weeks, and hadn’t noticed any problems, but evaporation of the electrolyte is only one symptom of a failing battery. Recently we’d found that occasionaly the heating would come on first thing, then shut down due to low voltage after 15 minutes or so. And the fridge would be off in the morning as well. So today I decided to investigate a bit deeper. 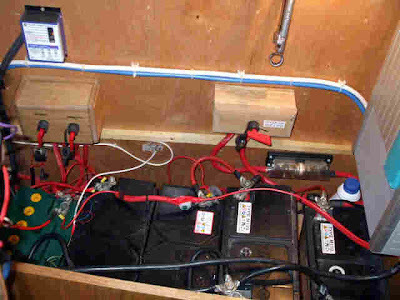 The levels were all fine in the cells, and with all 4 batteries connected up were delivering 11.6 volts. Isolating each battery in turn showed #1 at 10.2v, 2 and 3 at 12.0, and 4 at 11.3. So we’ve got one that’s definitely knackered, and another that’s suspect. # 1 and 4 disconnected. Further checks overnight and in the morning should confirm my feeling that 2 and 3 are OK, so I’ll only replace 1 and 4. In Sue and Vic’s case, they need to swap the lot as you can’t mix lead acid and AGM in the same bank. Walking around the area I’ve taken numerous photos, but am often disappointed that I can’t show more of the landscape in one picture. I have both Google’s Picassa 3, and Serif’s Photoplus 9 installed on my laptop, but neither of them have the capability to “stitch” several photos together to produce a panorama. So I had a mooch about on the old interweb, and came across Autostitch. At only 1Mb to download the demo version, it was get-able, even on my appallingly slow connection. 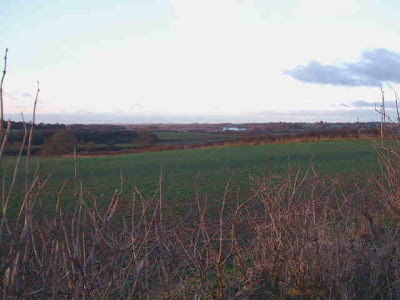 I’m very pleased with the preliminary results, this is 3 pictures I took yesterday from near Saddington looking south. The application is clever enough to stitch the frames together using common features automatically, and also adjusts the brightness to compensate for any variations. Look out for more panoramic shots in the future…. The Tesco man cometh, and we go a bit further north. Yesterday we moved the mile or so to Black Horse Bridge to await the arrival of our groceries. I usually get the quantities right, so when I ordered 1 for the carrots, I expected 1Kg. Yes, you guessed it….. Still, it was a fairly big one…. Makes up for the time I ordered 5Kg by mistake. 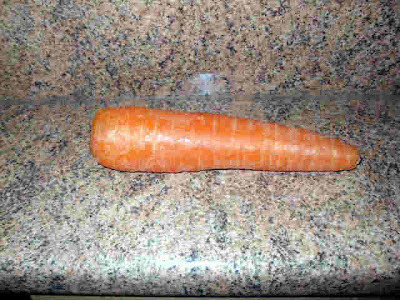 At least I like carrots. We decided not to move any further, just shuffled along a bit to nearer No Problem. Today we set off down to the junction, where I visited the services to empty and fill things as required. Then across to the shop for a Calor gas bottle to replace the one that ran out earlier in the week. We find that a 13kg bottle lasts us about 3 months. 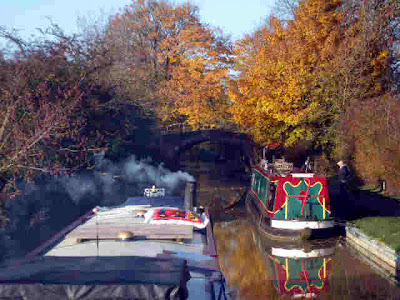 Across the junction, No Problem moored outside Bridge 61. 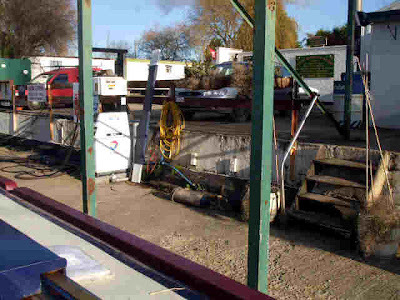 I don’t remember mentioning that Foxton Boat Services yard has closed, and the site has been cleared. I don’t know why, or what plans there are for the land. The shop at the bottom of the flight is still open, and the passenger trip boat "Vagabond" is on it's normal mooring, but the displaced hire boats are moored near the junction, I guess looking for new homes. The website is still up and running. 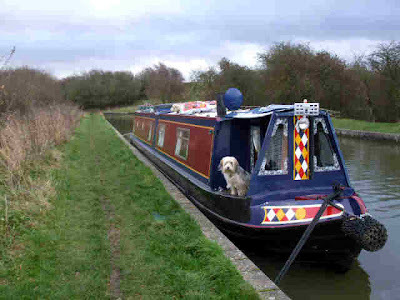 We had a gentle cruise to a mooring we’ve used before, near the feeder from Saddington reservoir. It’s been a bit breezy, but not as wet as forecast. In fact we’ve only had a couple of drizzly spells, and it’s been quite bright in between. We seem to have mislaid Sue and Vic. 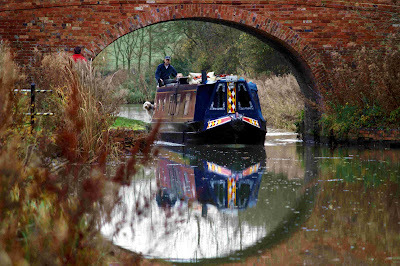 They were stopping at Debdale Wharf to discuss a new battery bank. I guess it must have taken longer than expected. They’ll probably catch up tomorrow. We’ve had a couple of days here near Gumley Road Bridge. The weather on Sunday was a bit grim first thing, but improved later, and yesterday wasn’t too bad. We had a bit of the snow that was forecast over Saturday night, but rain had washed it away by 10 am. The predominant feature has been the wind. Cold, from the north, and gusting quite strongly sometimes. So we chose to stay put until today. There was a hard frost overnight, hard enough to leave a scum of ice on the canal in sheltered spots. That’s ice. Honest. Under the vegetation. You just have to squint a bit. We moved off around 11, filled with water at the top, then set off down the flight. 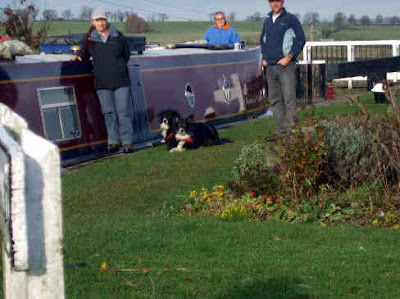 We were making good time, when the lock-keeper turned up and asked us to wait for 5 minutes while he ran some water off from the side ponds. They were quite full, and he was concerned that the bottom one might overflow, flooding the pub! 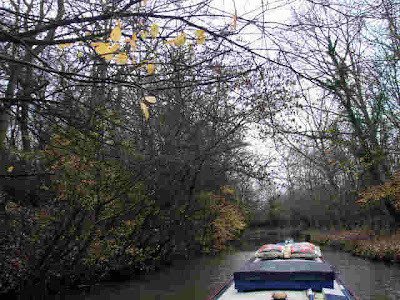 It shouldn’t have been a problem, but there was another boat following us down, bringing another lock full of water, so he was being cautious. Even with the pause, we cleared the bottom lock after 50 minutes. 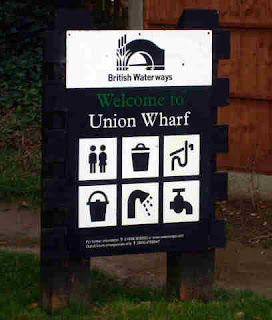 Then it was a matter of emptying the loo and the rubbish at the junction, through the 2 swing bridges, down the arm to turn at the winding hole, then back to moor near to bridge 6. I spent the afternoon making up a Tesco order on a very slow internet connection. But got there in the end. It’s being delivered to Black Horse Bridge tomorrow, so we’ll have to be there to receive it. It seems a lot milder down here below the locks. What a difference 75 feet makes to the strength of the wind. We have a rule that we don’t generally move on a weekend. But this time of year it’s so quiet, especially on the Leicester Section, that the reasons aren’t really relevant. I’m glad we did decide to move else we’d have missed a spectacular day’s cruising. 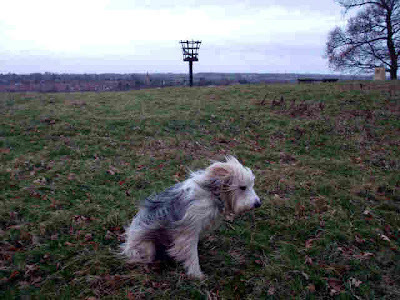 I started the day taking Meg for a bracing 4½ mile walk to Welford and back, for a newspaper. The low sun put all the countryside into sharp relief. 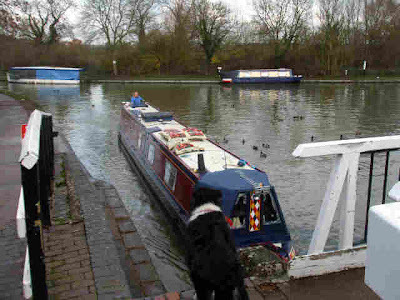 Then after breakfast we set off, heading to a stop at North Kilworth Wharf for diesel. I’d rung yesterday to confirm that we’d be able to declare our propulsion/domestic consumption split. Some suppliers, to make it easier for them, are insisting boaters buy at a fixed 60%/40%. Luckily most are allowing self declaration. Otherwise this would have cost us an extra £24 for today’s fill. Very pleasant people here, and the fuel isn't a bad price, either! I spent most of the £24 on 2 bags of smokeless and a Canal Boat magazine! The remainder of the trip was spent (mainly) in glorious sunshine, but with a breath of a cold breeze. The fine weather had brought a lot of towpath walkers out and about, including a couple of shooting parties. 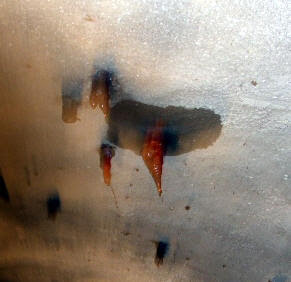 Through Husbands Bosworth Tunnel I noticed these odd stalactites hanging from the ceiling. Mostly they’re pale coloured, but these are red. 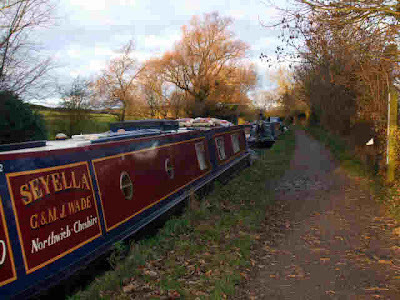 But we only saw 3 other boats moving, and 2 of those were Canaltime boats out of Union Wharf. 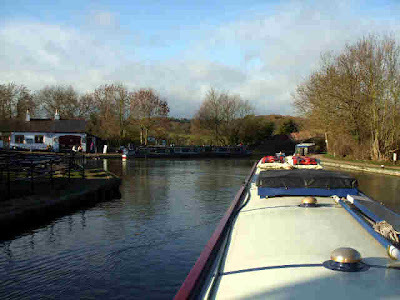 I was tempted to pull over at a likely spot near Lubbenham Lodge Bridge, but we’d planned to get to the top of Foxton Locks so pressed on, mooring just before Gumley Road Bridge, ½ a mile above the flight. It’s certainly cooling down now that the sun has set. We didn’t have a frost last night, but I think it’s likely tonight. Last Sunday, while heading for Foxton, a gentleman called Chris Mann caught us on camera. This is one of his excellent shots. Thanks, Chris. They’re intending to do the same as us in a few years. Look forward to seeing you…..
Getting Colder…..Break out the winter woolies! The wind got up overnight and backed to the north. A lot colder this morning than of late. Meg and I took a stroll up Crack’s Hill as planned. Pretty blowy on top! Looking West, Seyella near the middle of the frame. There’s a surfaced bridleway running from Yelvertoft to Crick, running just to the east of the hill, so we got back to the boat in an unusually clean condition! We were on the move at 09:40, and had an uneventful cruise back up to Welford, arriving at around 13:30. I made a note of a couple of pleasant out of the way mooring spots on the way. 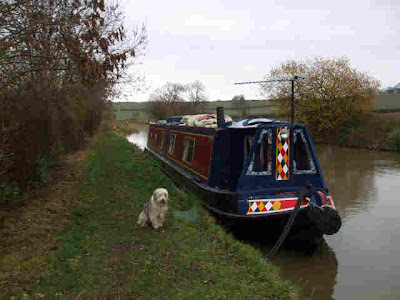 There’s good moorings near Hemplow Hills, with, I expect, some good walks nearby. 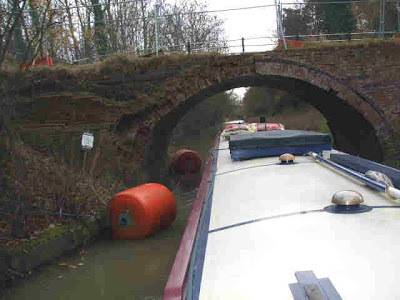 Bridge 34, red brick and typical of the crossings on this section. 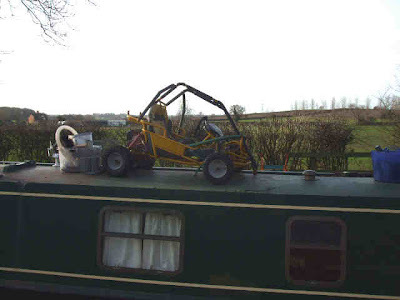 Most boaters make do with a bike! It’s been pretty windy, but not too bad on the water. 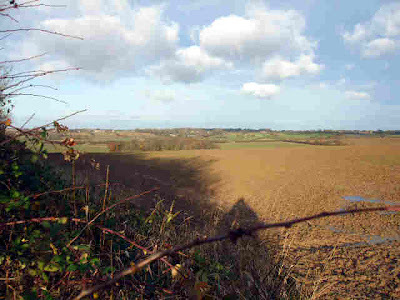 The hedgerows act as an effective windbreak. I wonder if that’s why they were planted. 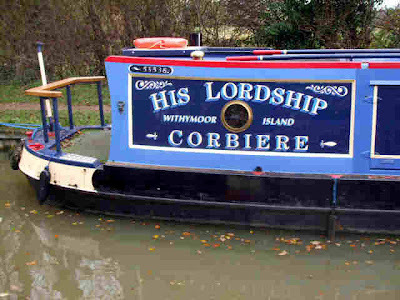 I wouldn’t like to be on the Shroppie though, with it’s high, exposed embankments. 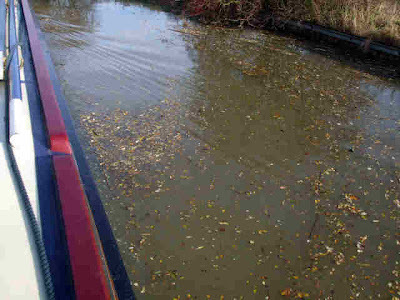 One hazard at this time of year is the leaves floating on and just below the surface of the water. No, they don’t just affect the railways. The “soup” is thick enough in some places to clog the propeller. Windy? Yes. Cold? Not particularly. I think we’re saving that up for tomorrow. I took Meg for a walk across the fields towards Welford this morning. 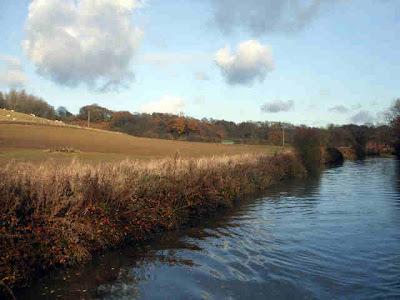 Beautiful long views open up as you climb up onto the ridge alongside the canal. As I mentioned yesterday, the way markers are not a patch on the yellow posts in Leicestershire…. We got away a bit earlier today, 10:15. 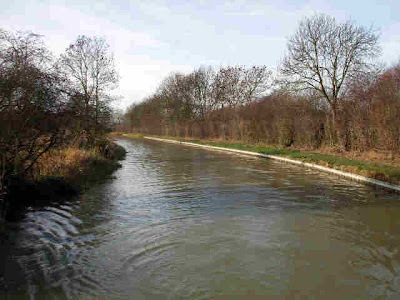 The canal continues to wind it’s tortuous way through the rolling Northamptonshire countryside. As the crows flies (gets blown?) we’ve gone 5 miles today. By canal it’s over 8. It’s a very pretty stretch of canal up here on the summit, but I think budget constraints are starting to bite a bit. You’d be struggling to pass if you met boats in some areas. And Bridge 32 hasn’t got any better since No Problem came up this way a couple of weeks ago. We intended to cruise down to Crack’s Hill, wind (turn around) there, and come back up to Yelvertoft to get some essential supplies. 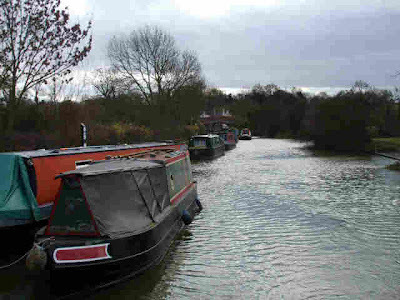 But the moorings approaching the village were pretty crowded, some designated winter moorings on the 14 day section. 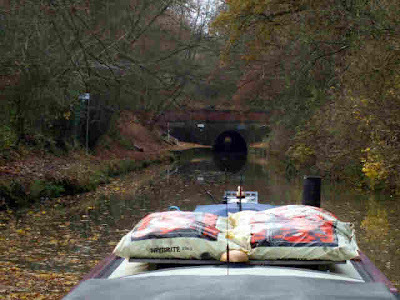 So we moored just past the winding hole below Crack’s Hill. Toddled off to the village with Meg, it’s only about 1½ miles from here. The Post Office/General Store is one of those that seems to have almost everything. It’s shops like this that’ll be hit hardest if the Government continues to close the PO counters. Oops! Sorry, Greygal. I’ve done it again. 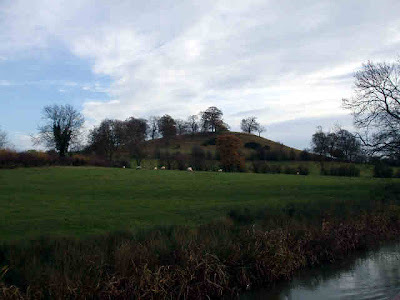 I’ll have a walk up the hill tomorrow before we set off back towards Foxton. As we’re so close, it’d be churlish not to, wouldn’t it? Mag’s restless night, and a breezy cruise. Mags didn’t sleep too well last night. The wind got up, blowing the clouds across a nearly full moon, and Meg and I were muttering in our sleep, making Mags think there were people with torches outside! So she slept a bit later than normal this morning. Meanwhile Meg and I set off to see Husbands Bosworth village. Seems a pleasant place, with a pretty spectacular church. 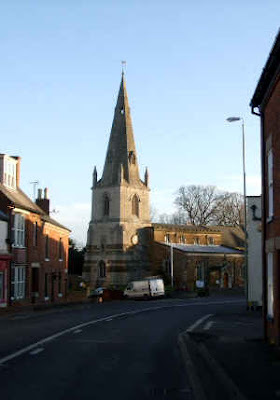 All Saints Church, Husbands Bosworth. 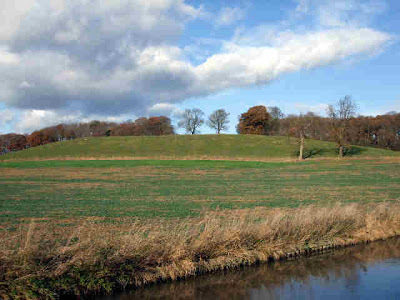 Parts of the structure are believed to date from 1220. 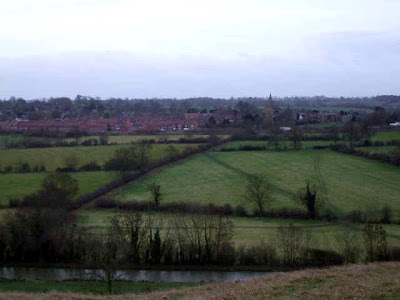 The name of the village may be derived from the Saxon for Bar’s farm or settlement. The “Husbands” (farmers) prefix was added, probably in the 16C, to differentiate it from the market town of Market Bosworth to the West. It is likely that the area has been settled for the last 5500 years! In July 1616, nine witches of the village were hanged in Leicester for allegedly bewitching the son of the Lord of the Manor. I wonder if it was the shades of these women who kept Mags awake last night…. More recently, the RAF had an airfield built here in 1943, primarily as a training field. It’s now used by the local gliding club, and the East Midlands Air Support Unit. This is a rapid-response air support unit, set up by the combined police forces of Leicestershire, Warwickshire and Northamptonshire. The General Store/Newsagent provided a newspaper and a birthday card for Vic, and I couldn’t resist the treacle tart on the counter. There’s also a Post Office further up the street, passed as I headed out onto the hill to look for the horse track leading over the tunnel. I intended picking it up where it crosses the main road, then walking down back onto the towpath at the tunnel mouth. But what I think it was is now incorporated into someone’s drive, with a sign saying “Warning, Alsation Loose Inside”. Gave that a miss then, and went back the way we came. We finally set off at around 11:15, not intending to go so far. The wind wasn’t too much of a problem, but the way this section twists and turns you’re never quite sure which direction it’s going to come from next! One minute it’s in your face, the next it’s behind your right ear! It’s stripped most of the remaining leaves off the trees, now. 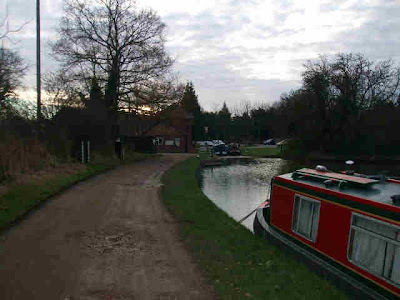 Past Welford Junction and the 1¼ mile arm to the town, and the good moorings just after the junction. We’ll probably stop here on the way back, either before or after nipping down the arm to the sanitary station. 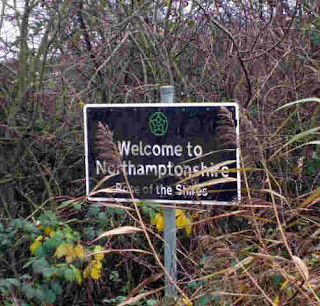 We toddled on a bit further, crossing into Northamptonshire (The Rose of the Shires, apparently) stopping between bridges 39 and 38. We’re fairly sheltered from the wind here. I was just tying up when a chap on NB Pintpot shouted as he passed, “We got frozen in there once!” Not tonight though, I think. Took Meg out for a bit, and found the path across the fields to Welford. 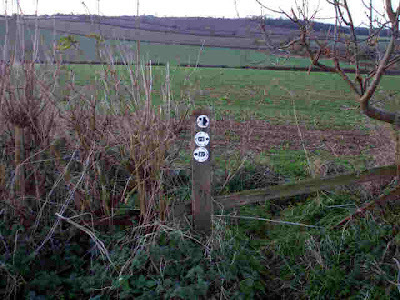 The waymarkers aren’t as good here as around Foxton. You have to be almost on top of the little white discs before you see them. May go tomorrow morning for bread and milk. Either that or there’s Yelvertoft and Crick a bit further on…. Bacon butties and treacle tart for lunch. Eat your heart out, Graygal! 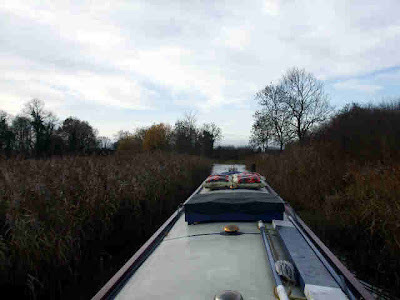 Since leaving the Trent in October, we’ve steadily climbed, using the Soar valley then cutting across country. 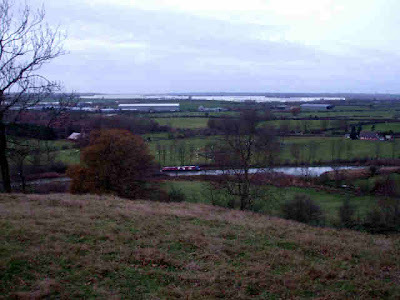 We’ve made 320 feet, and this is the highest point on the canal between Sawley and Fenny Stratford, just south of Milton Keynes. 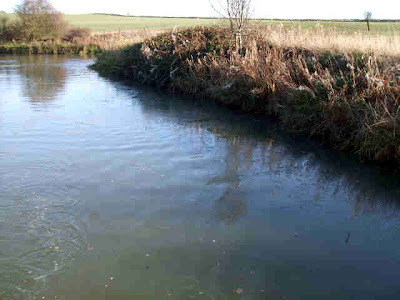 Here the canal starts to climb again, to the next summit level at Tring on the edge of the Chiltern Hills. 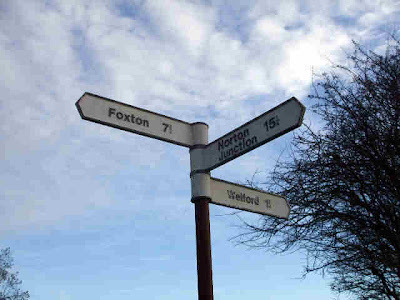 We moved up to Foxton to join Sue and Vic on Sunday. An uneventful 1 hour’s gentle cruise, in pleasant weather. 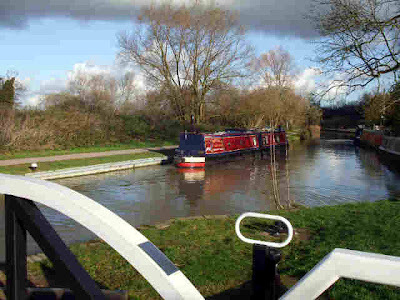 Spent a quiet couple of days, pottering about and walking the dogs, then today we set off to go up the Foxton flight of locks. Well, we can’t be up here and not do them, can we? 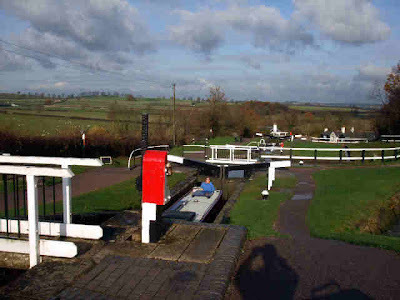 The flight is one of the iconic sites on the canal system. 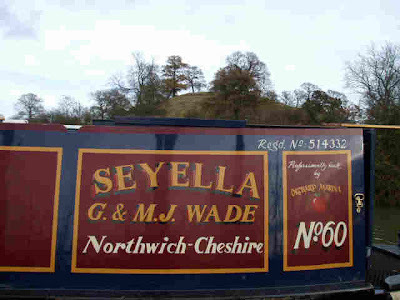 Built in 1810 and lifting the canal 75', they were in continuous use until 1900. 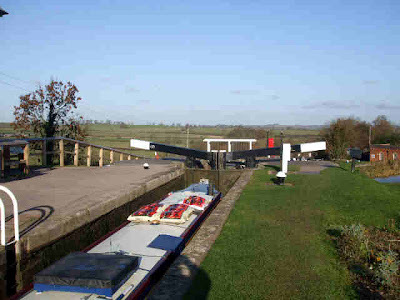 Increase in traffic causing congestion, and railway competition made the Grand Junction Canal Carrying Company to rethink the solution, employing Gordon Cale Thomas to design a boat lift to carry a pair of narrow boats (or a wide beam barge) up alongside the flight. 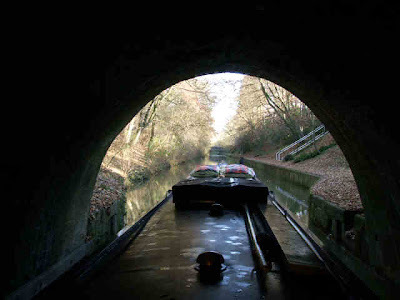 Unfortunately, failure to widen the flight at Watford Gap meant that the potential for wide beam carriage could not be realised, and trade on the canal continued to be lost to the railways. Finally a decision was made in 1911 to mothball the lift and put the locks back into commission. It was never put back into use and the machinery was sold for scrap in 1928. The site remained derelict until a recent lottery grant enabled the Foxton Inclined Plane Trust to clear and tidy the area, now providing a valuable amenity. The Trust untimately aims to put the lift back into working order. I'll certainly be there on that day! Sue volunteered to join us, opening the 2 swing bridges to the junction, then helping us up the flight. It was at the second, new, swing bridge that I heard a scrabble of claws then a splosh. Looked around and Meg is splashing around behind us. So I stopped the boat (we were going dead slow anyway), she caught up and I hauled her back on board. 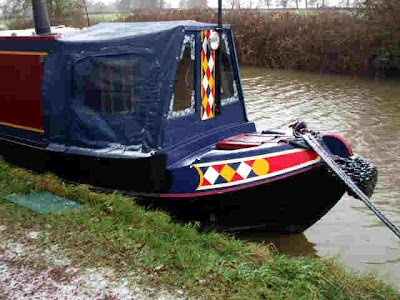 No harm done, just puddles of canal water through the boat till we got her reasonably dry. 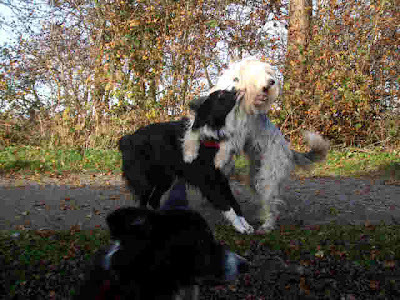 I think she was leaning out to watch Lucy and Meg on the towpath, and lost her balance. None the worse for wear, she had a good chase around at the bottom lock. 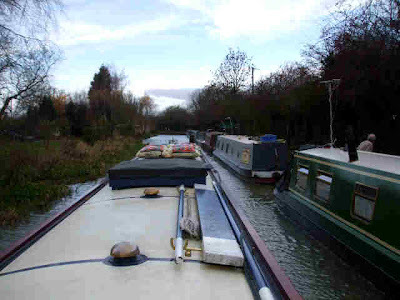 We got to the junction to find another boat just ready to go up. Typical, ain’t it. We seen no more than a couple of boats a day, then one sneaks in front of us! Only joking, they didn’t hold us up at all, even though they were novices. 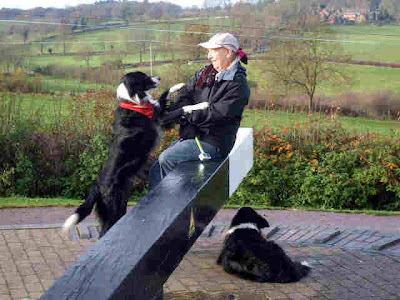 Terrible picture, taken with the camera sat on top of a post, using the timer. Chopped ½ my head off! We filled with water at the top and said goodbye to Sue. 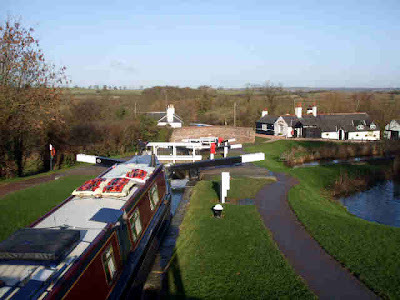 We’ll meet up again in a week or so, to share the locks going north to and through Leicester. 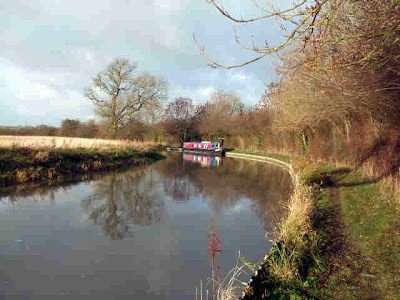 A very pleasant couple of hours, just gently cruising along and admiring the views took us to a likely spot just 1 mile short of Husbands Bosworth. That’ll do for tonight. We’ve been spoilt by the good towpaths around Foxton. Down here they’re muddy and badly eroded in places. Good job we’re only here the 1 night. Here’s one for Carol, spotted just south of the locks. Things went just a little pear-shaped with the deliveries on Wednesday. I was out with Meg when the phone rang at 07:50. 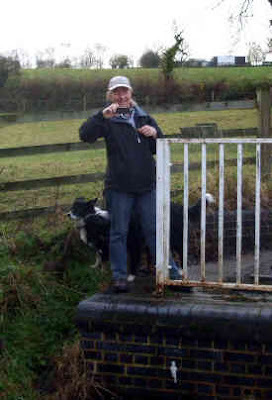 It was the coal man, looking for us at Black Horse Bridge. I’d arranged the delivery for around lunchtime, which Mags made clear to the chap in no uncertain terms! He said he’d another run to do in the area, so would get back to us after lunch. 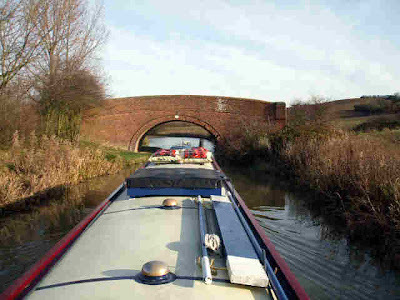 So we toddled off towards Foxton, arriving at Black Horse Bridge 20 minutes later. The Tesco delivery (mainly dog food) arrived at noon, followed by the smokeless at 13:30. On the way for the deliveries. Then it was a matter of going up to the junction to turn around to head back. So up and back through both of the swing bridges. 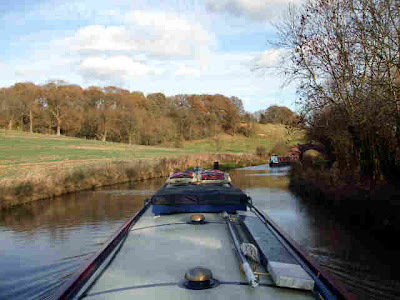 We moved on to about ½ way along the arm, mooring up about an hour before No Problem arrived, Sue and Vic having been down to Union Wharf for water. Yesterday we intended to go to the wharf ourselves, but I decided to have a 10½ mile run first thing, followed by a long walk with Meg, and frankly I didn’t have the energy! So we spent the day stationary, then this morning set off to the end of the arm. It was a lot nicer today anyway. Quite warm, sunny spells and a gentle breeze. We had to wait a bit for the service point to be vacated. I’d forgotten that the Canaltime/Tillerman base has a few boats out on Fridays, so they were busy preping the craft to go out. But, including a trip into town for essentials, we were back to our previous spot by 15:00. On our own now, No Problem having moved back towards Foxton. 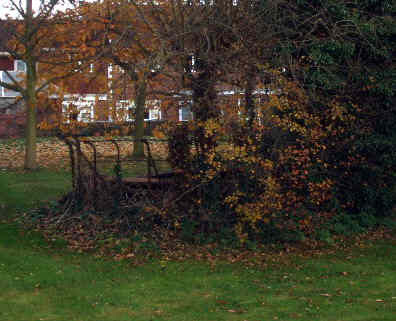 Sue, on her blog, mentioned the long gardens of the houses on the outskirts of Market Harborough. Evidence of a more rural past can be seen, some of the trees surrounded by a wrought iron fence to protect them from long gone sheep and cattle. 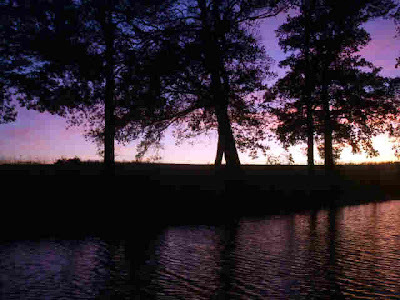 A fine sunset promises a good day tomorrow. A place in the country..